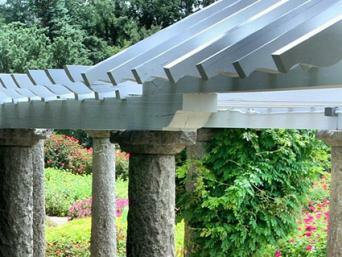 Pergolas are garden shade structures that create a unique architectural statement in the landscape. They are generally made with wood and are a feasible weekend project for the determined do-it-yourselfer. There are many approaches to pergola design, but there are two main types: pergolas that are a destination in the landscape and pergolas that cover pathways from one point to another in the landscape. Both are frequently used as support structures for vines. This basic pergola design could easily be scaled up to a larger version big enough to accommodate a picnic or backyard party. 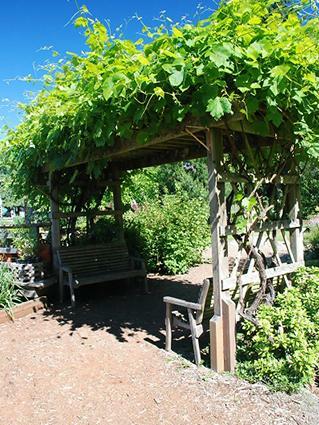 This pergola can support lightweight vines like jasmine or honeysuckle. In addition to the materials listed, you may want to print the included plans for reference. Use Adobe to do so. 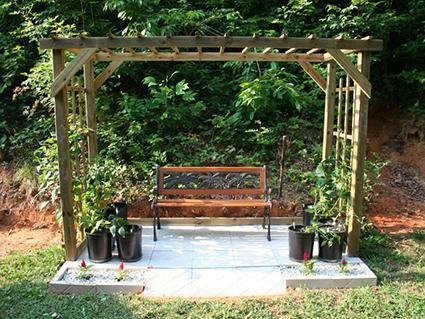 Locate the pergola in a flat, quiet corner of the yard where you would like to have a bench in the shade. Mark the four corners of a 4 x 8 foot rectangle on the ground with marking flags. Dig a hole eight inches wide by 16 inches deep at each of the four points using post hole diggers. Mix two 60-pound bags of concrete in a wheelbarrow; set a post in one of the holes and have a helper hold it plumb (using a level) in both directions while you shovel concrete into the hole around the post. In an adjacent hole, set a second post in concrete in the same fashion. Mix another two bags of concrete and repeat the process with the other pair of posts. Cut two 8-foot 2 x 4s in half and screw a pair of the four-foot sections horizontally between the top of each pair of adjacent posts using 3-inch exterior wood screws. The tops of the posts will be sandwiched between the 2 x 4s. Screw a 10-foot 2 x 4 between the tops of the posts on the front and back sides to form horizontal beams across the wide side of the pergola. The ends of each 2 x 4 will extend 12 inches beyond the posts on either side. Cut the remaining 8-foot 2 x 4 into four 2-foot sections and then cut a 45 degree angle into each end. Screw these in as corner braces between each posts and the 10-foot beams using 3-inch screws. Cut five 9-foot 2 x 2s in half and screw them into the top of the 10-foot beams every 12 inches with 3-inch screws. The ends of each 2 x 2 will extend six inches beyond the beams on either side. Cut three 8-foot 1 x 2s in half and screw them into the posts on the short side of the pergola every 24 inches measured from the top down with 1-3/4-inch screws; these can be used as a trellis support if you want to add one. Place your bench below the pergola. This style of pergola is intended to create a shady walk through the garden and can support large woody vines like grapes or wisteria. 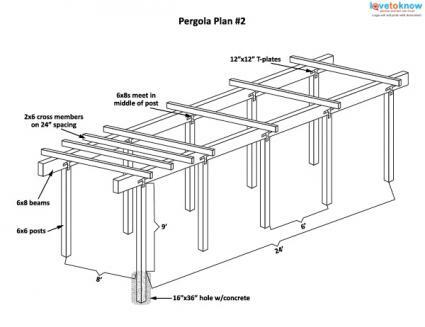 The design can be scaled to any length desired though the instructions below are for a pergola 24 feet in length. Along with the listed materials, print the plans to help you complete the project. 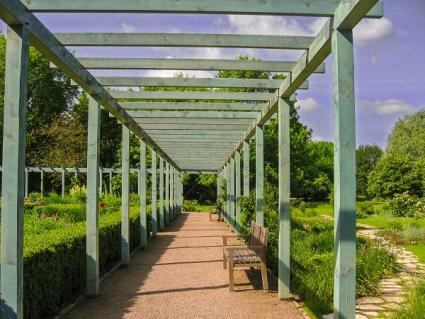 Locate this pergola over a straight, flat path through the garden. Using marking flags, mark the four corners of an 8 by 24-foot rectangle; mark the midpoint between the 24-foot sides and then mark the midpoint between each of those points. Dig a hole 16 inches wide by three feet deep for the posts at each of the flag locations. Mix three 60-pound bags of concrete in a wheelbarrow; set a post in one of the holes and have a helper hold it plumb (using a level) in both directions while you shovel concrete into the hole around the post. Mix another three bags of concrete and repeat the process with the remaining posts. Rest 14-foot beams across the top of the posts along the long sides so they meet on top of the middle post. The beams will extend two feet past each of the end posts. Install a 'T' plate on the inside and outside of each post-beam joint using 1/2-inch lag screws. First, though, drill a 3/8-inch pilot hole for each one. Screw the 10-foot 2 x 6 boards as cross members every 24 inches on top of the beams using 3-inch exterior screws. 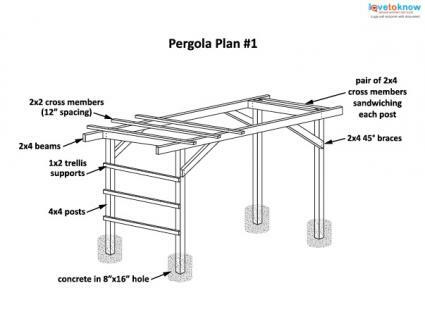 These two common pergola designs can be customized in a number of different ways. Instead of the ends of beams and cross members being perfectly square, cut a more interesting tapered shape into them. For greater sun protection add a layer of lattice to the top of the pergola; lattice can also be added to the side walls for a three-sided partially enclosed structure. Consider a pitched 'roof' for the pergola rather than a flat plane - this could be angled in the style of a simple shed roof or it could meet in the middle like the gable roof of a house. Don't forget that you can also paint or stain your pergola to match other elements of your outdoor landscape. Building a pergola, especially one with big posts and beams, is hard work. But afterwards you will have a backyard to retreat to enjoy for many years to come.